Water damage restoration and cleanup are only one of many services our SERVPRO of La Grange Park / North Riverside team offers. 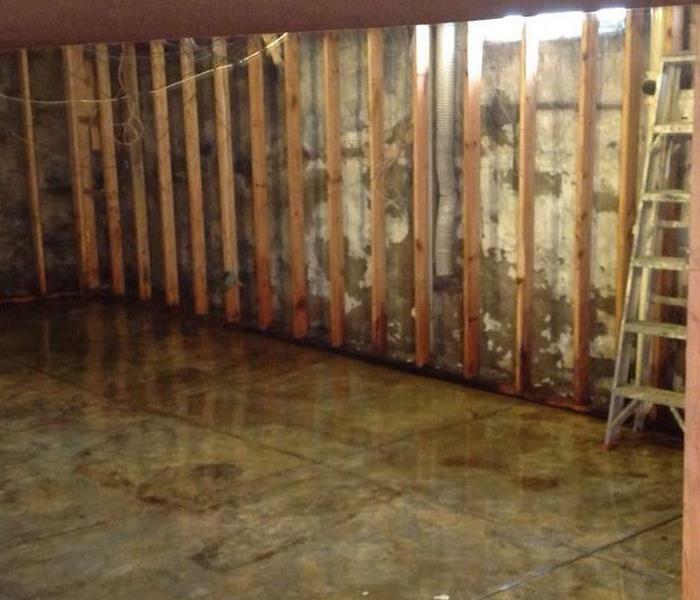 If your home or business is damaged by a water loss, give us a call today! 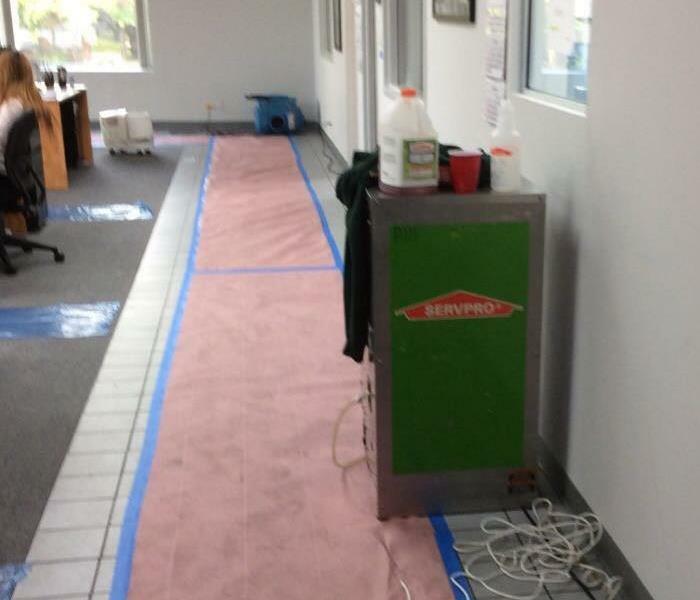 The SERVPRO drying equipment is up and running after a loss caused severe damage in a commercial Berwyn, IL, property. If you experience fire, mold, or water damage on your commercial property, give SERVPRO of La Grange Park / North Riverside a call today. A fire loss can bring your business to an abrupt halt and it is crucial to have a certified team on site as quickly as possible to get your business back up and running. SERVPRO of La Grange Park / North Riverside is always on standby and ready to respond! When disaster strikes, you can trust SERVPRO of La Grange Park / North Riverside with your restoration and cleanup needs. Our team has advanced technology and equipment to make any size loss on your residential or commercial property "Like it never even happened." The aftermath of a fire can be devastating to your home or business. SERVPRO of La Grange Park / North Riverside has a certified team with the expertise, experience, and equipment to restore your property back to preloss conditions after ANY size loss. No matter day or hour, SERVPRO of La Grange Park / North Riverside is always on standby and ready to respond to your fire, mold, or water damage. If disaster strikes, SERVPRO is Here to Help! After a fire in the warehouse, SERVPRO of LaGrange Park/North Riverside technicians had smoke and soot to clean up in the office area. We made sure that we protected their flooring, washed down all the walls and desks, and got their office back up and going in no time. After Hurricane Harvey hit Houston, SERVPRO of LaGrange Park/North Riverside mobilized to Houston to help with the relief efforts. 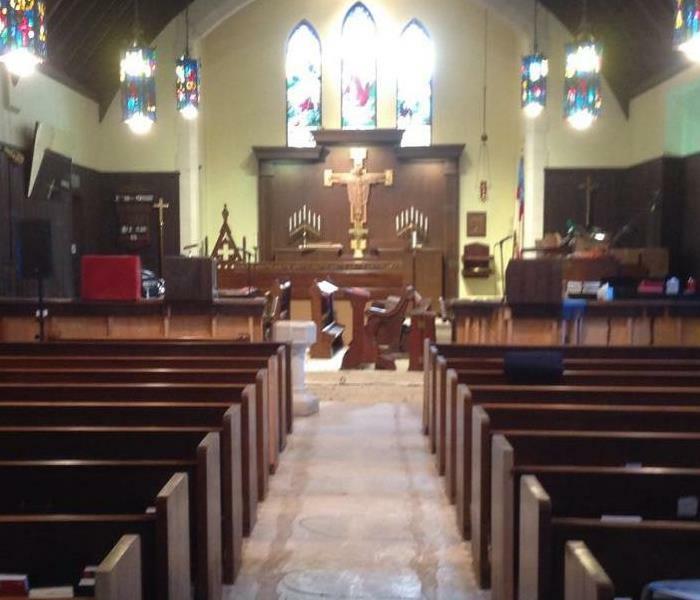 This is a sanctuary in a local Houston area church that we are helping to restore and allow the church members to return to their congregation family. Making it, "Like it never even happened." SERVPRO of La Grange Park/North Riverside received a call about a fire that took place in a local hotel. When we arrived onsite we realized quickly that our crews were going to be busy. Thankfully no person was harmed in the fire, and we could get to work right away. There is no size disaster that SERVPRO can not handle. Call us with all your fire restoration needs at 708-240-4873. SERVPRO of LaGrange Park/North Riverside hosted a fire damage class for our local insurance agents. We were lucky enough to get the Fire Inspector, Anthony Monk, from Broadview fire department to come out and give a hands on demonstration on the proper way to handle a fire extinguisher. Our agents loved the experience and it made the things they were learning in class really come to life. We received our new hard hats today for a big job we are starting next week. Our office manager took that as her opportunity to practice safety first! If you have a fire, water, or mold job you need help with, SERVPRO of LaGrange Park/North is always "Faster to any size disaster". Welcome our newest member of the fleet. Big Green! We found Big Green at a local auto auction for used post office vehicles. No, shes not a used Pea Pod vehicle. She gets that a lot. We got Big Green all cleaned up, painted that beautiful SERVPRO green, then she got all prettied up with our lettering and contact information. Big Green will be the newest of SERVPRO of LaGrange Park/North Riverside's water emergency vehicles. She will be loaded up with all the equipment we need as well as other cleaning materials for all those bigger water emergencies. We are proud to add her to our fleet of SERVPRO vehicles. If you have water, fire, or mold damage call SERVPRO of LaGrange Park/North Riverside at 708-240-4873. We will make it "Like it never even happened." In honor of national "Take your dog to work day" we are showing off Homie. 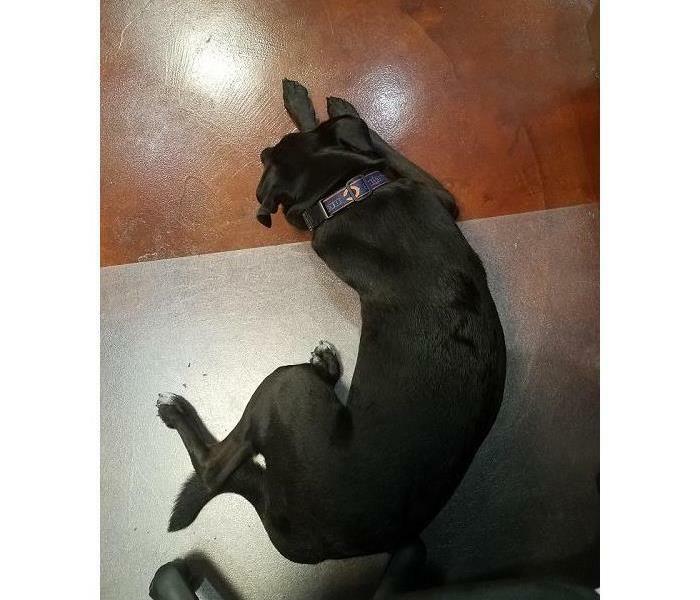 When he visits the office he loves to take a nap right at our desks Today, we honor you Homie! Enjoy your day! It doesn’t take a huge flood to cause thousands of dollars in damage. 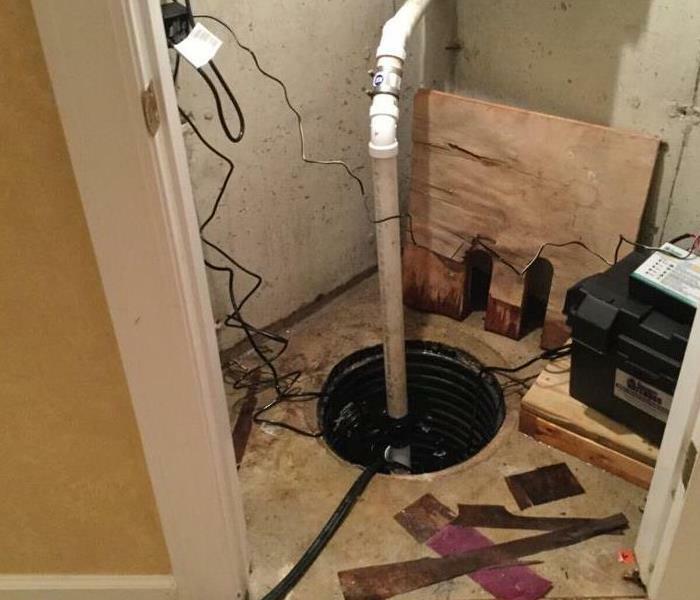 A sump pump failure can cause quite a bit of damage to your Chicago area home. 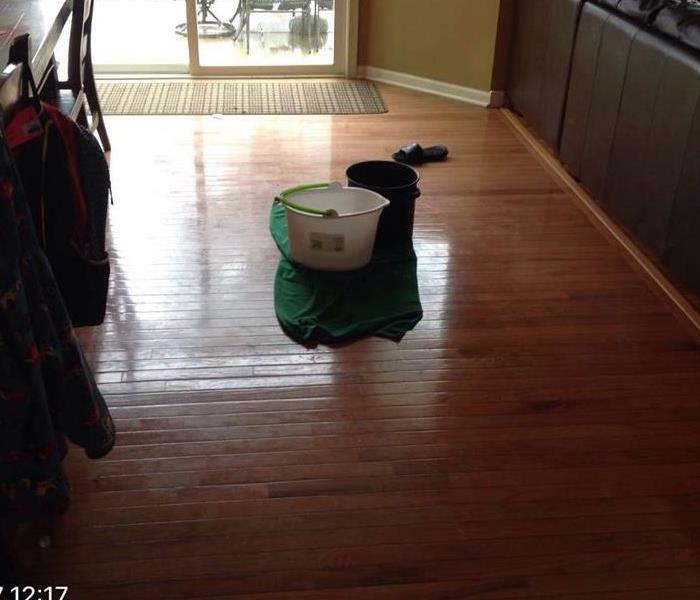 Call SERVPRO of LaGrange Park/North Riverside at 708-240-4873 with all your water damage needs. This home had water running down the walls and on to the floors of several areas of this house. The hurricane rains and flooding made it to where almost every room of this house had flood damage. 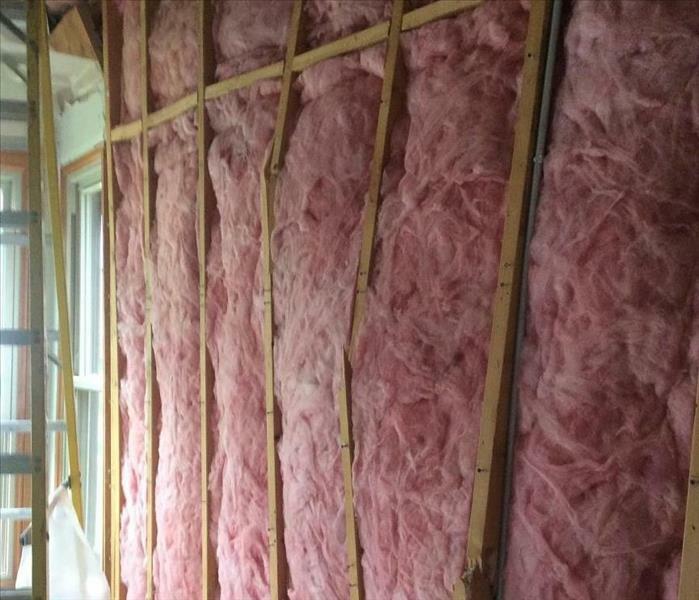 This home had water behind their walls from an air condition leak. The homeowners called SERVPRO of LaGrange Park/North Riverside to come help with the clean up. SERVPRO of LaGrange Park/North Riverside is here to help with all your water damage needs to your home or commercial property. SERVPRO of LaGrange Park/North Riverside was called to this home after a fire broke out in the upper part of the home. 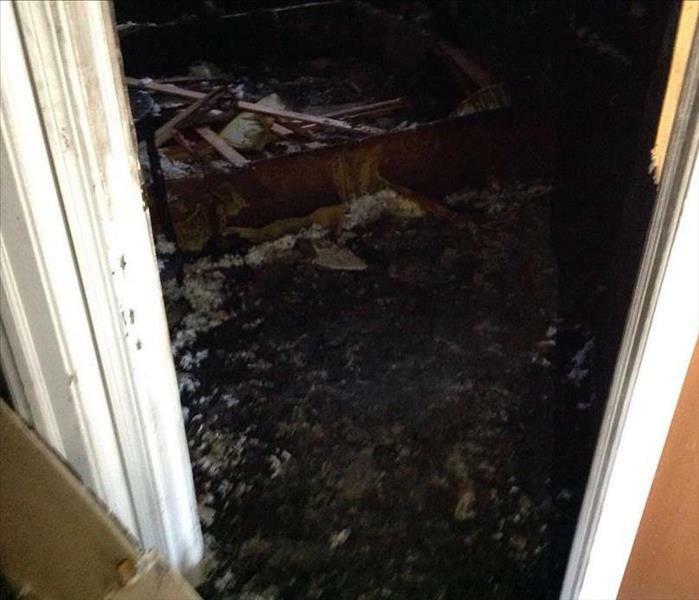 There was extensive smoke damage, water damage from putting the fire out, and from the fire itself. Give SERVPRO of LaGrange Park/North Riverside a call at 708-240-4873 for all your fire restoration needs. 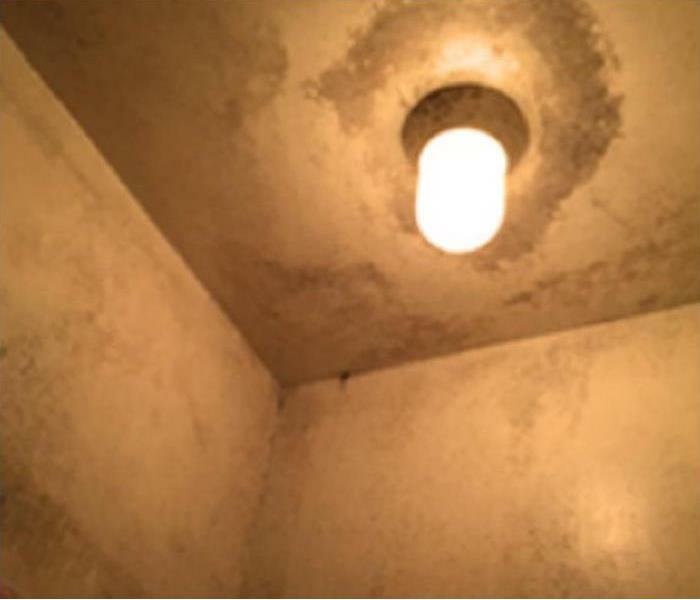 Did you know that mold loves to grow in the bathroom of a home because of all the moisture found in there? If your bathroom doesn’t have a vent, or if your vent isn’t working properly, then the moisture can not escape. When moisture can not escape, mold grows. 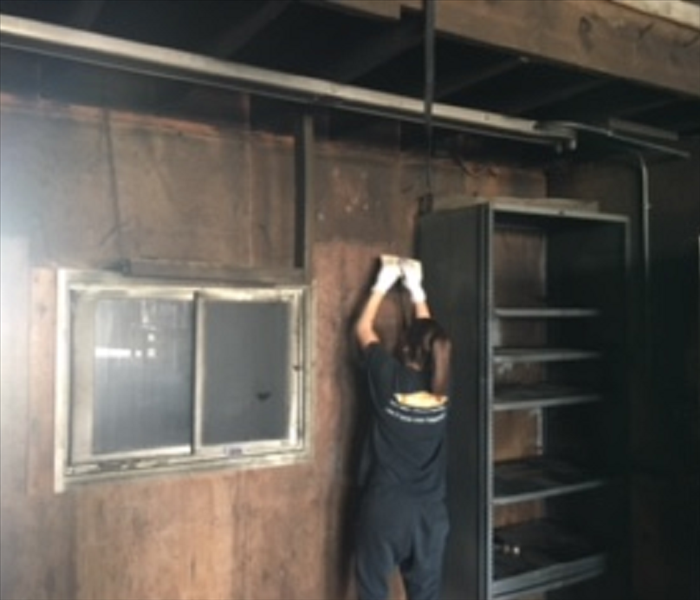 We are trained mold damage specialists who get started quickly to get your home or business back to normal, with specific training and certifications to handle your restoration needs. 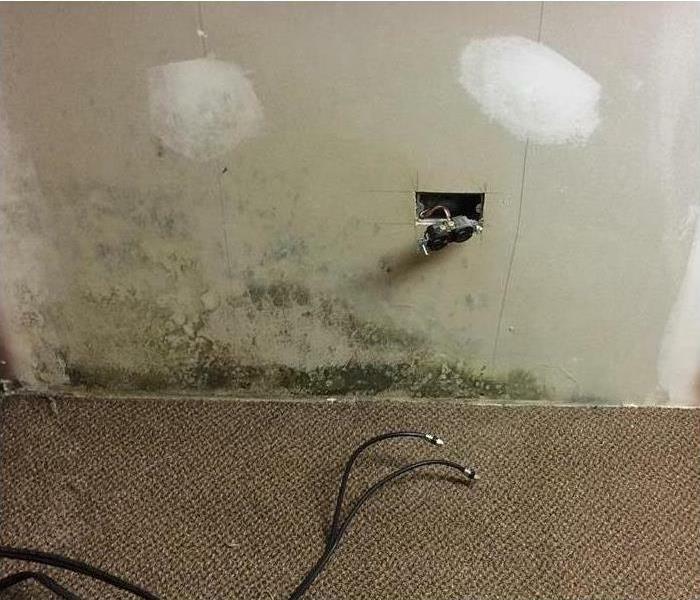 Call us for all your mold remediation needs at 708-240-4873. This basement had mold growth on the ceiling due to lots of water damage over a long period of time that was not taken care of properly. 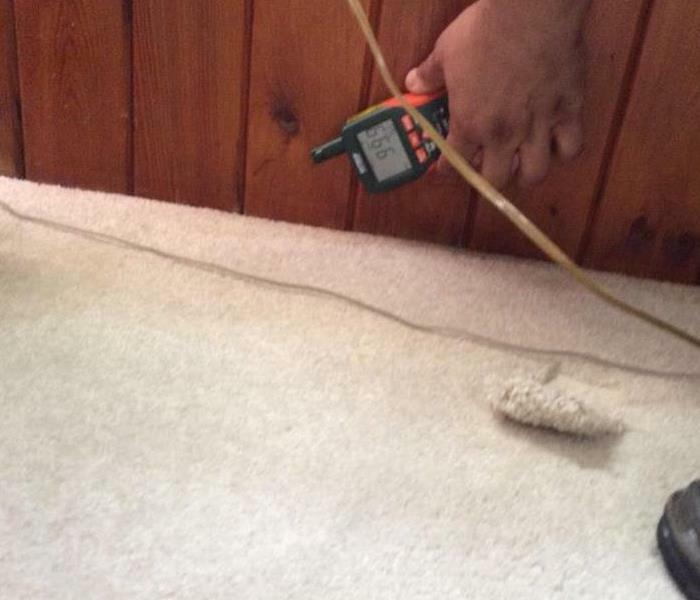 If you suspect mold in your home, call SERVPRO of LaGrange Park/North Riverside today at 708-240-4873. SERVPRO of LaGrange Park/North Riverside was called to look at a fire at a local Mexican Restaurant that happened at lunch time. 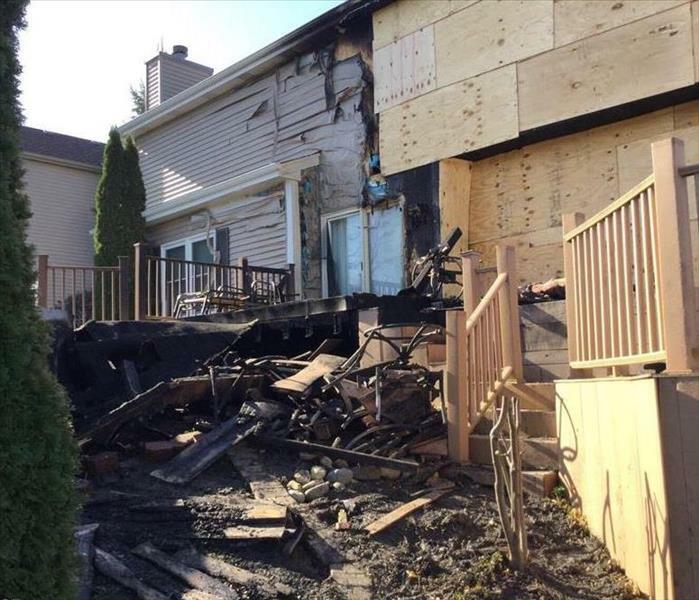 This fire was caused by a flare up from the outside BBQ grill. SERVPRO of LaGrange Park/North Riverside was called out to help with the clean up and board up of this property. 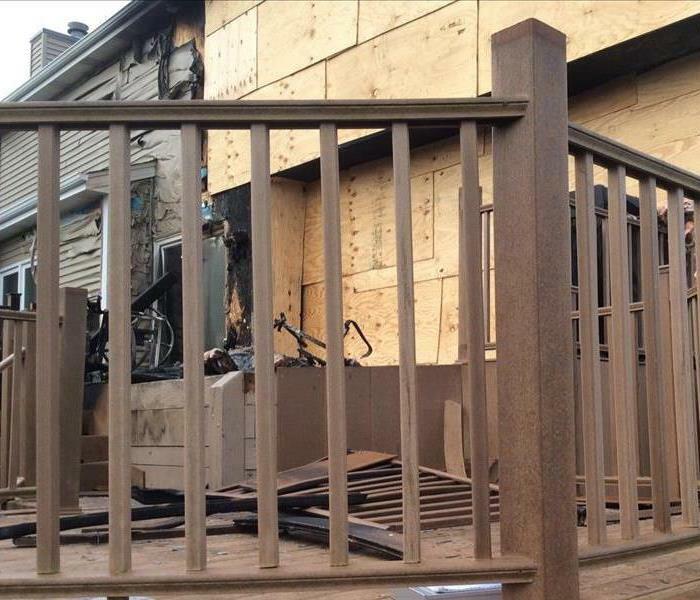 If you have fire damage to your home or commercial property, give SERVPRO of LaGrange Park a call at 708-240-4873. 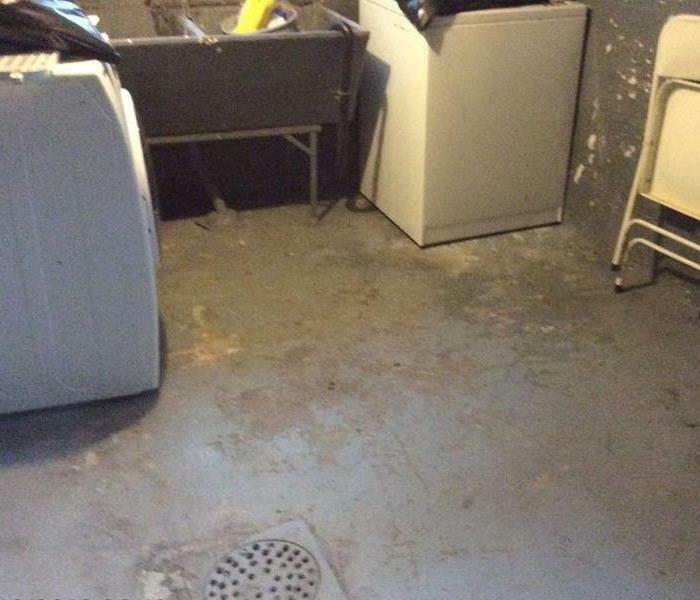 This condo unit had sewer water back up that affected not only this unit but the unit next to it. 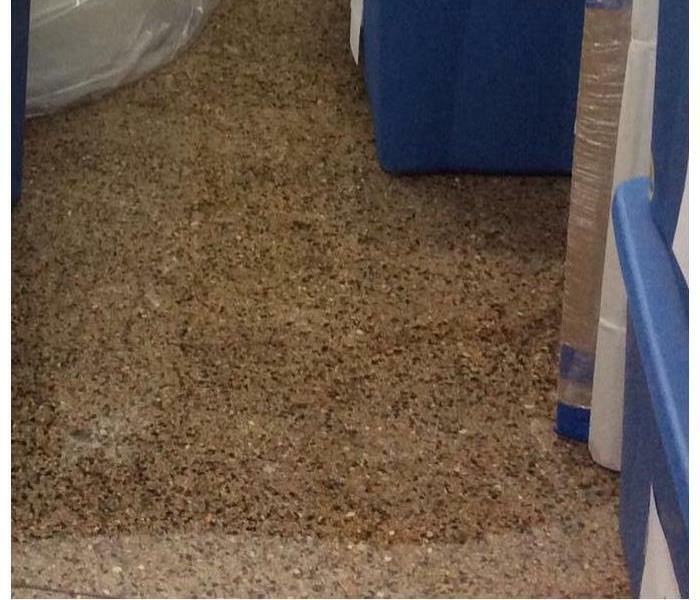 SERVPRO of LaGrange Park/North Riverside was able to arrive onsite and make it "Like it never even happened." 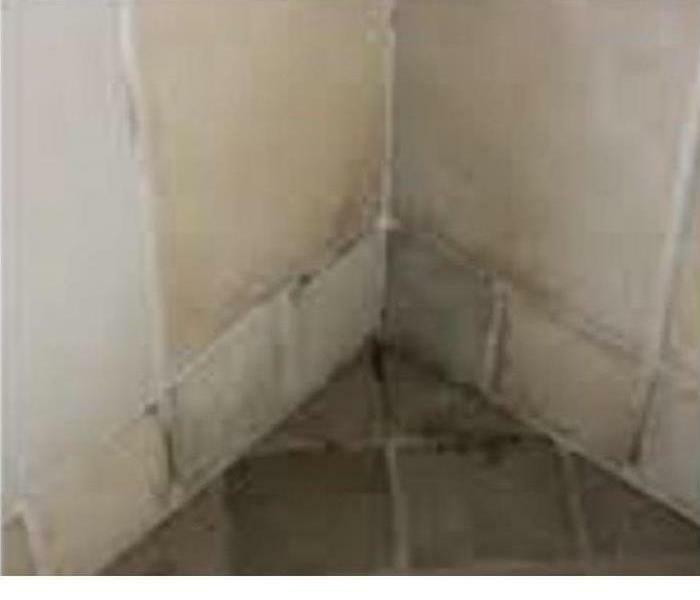 Mold growth in a bathroom is quite commonly seen. The bathroom often gets mold due to all the moisture that can be found and lack of proper ventilation. If you have mold in your home, give SERVPRO of LaGrange Park/North Riverside a call today at 708-240-4873. We are here to make it "Like it never even happened." 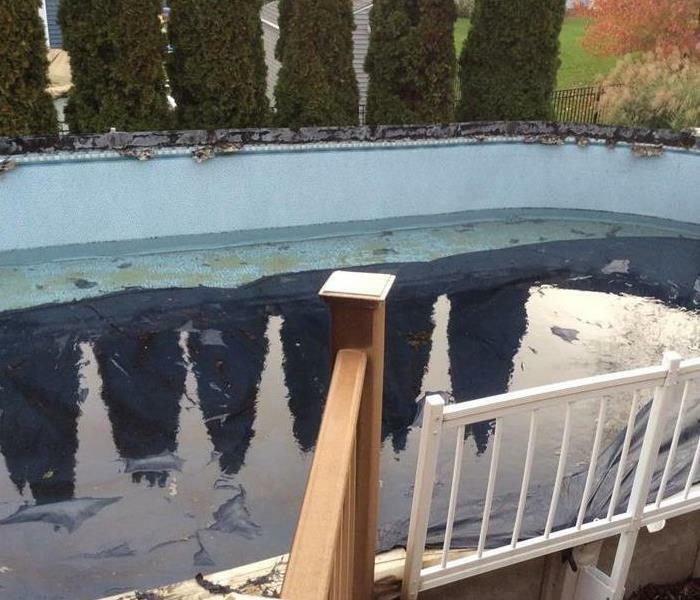 This home had a fire in their pool water heater, and had extensive damage to their pool and deck area. 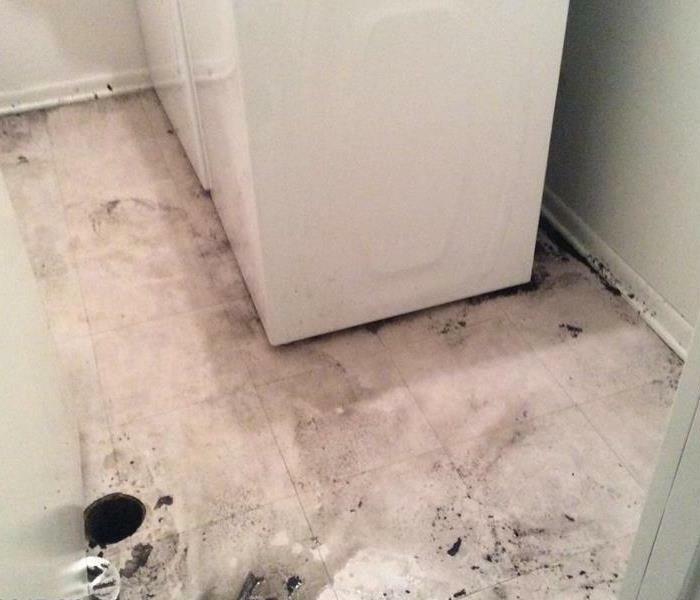 SERVPRO of LaGrange Park/North Riverside was called out to help assist with making it "Like it never even happened." Its that time of year again that everyone wants to be outside and BBQing, swimming in their heated pools, and having a fire pit. All of that is great, but when a fire breaks out and you least expect it this could be the aftermath. SERVPRO of LaGrange Park/North Riverside is here to help. Call us for all your restoration needs at 708-240-4873. SERVPRO of LaGrange Park/North Riverside participated at our local chamber of commerce golf outing today. 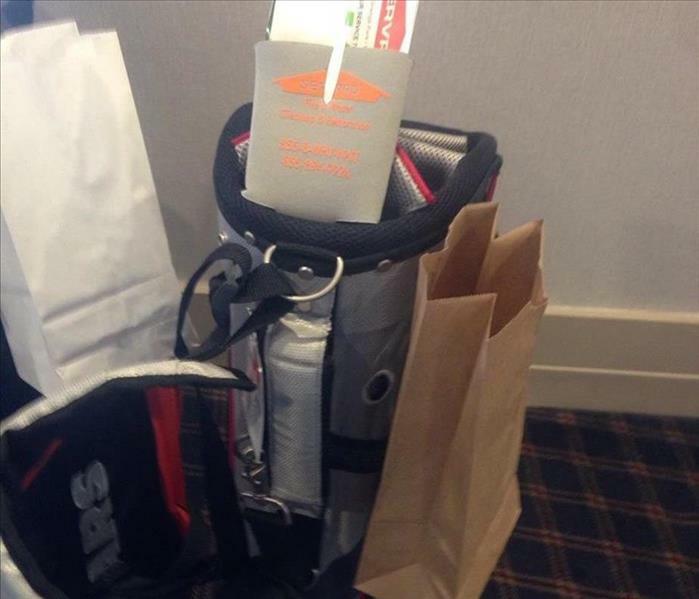 We donated this golf bag for one of the silent auction prizes, as well as enjoyed time golfing. 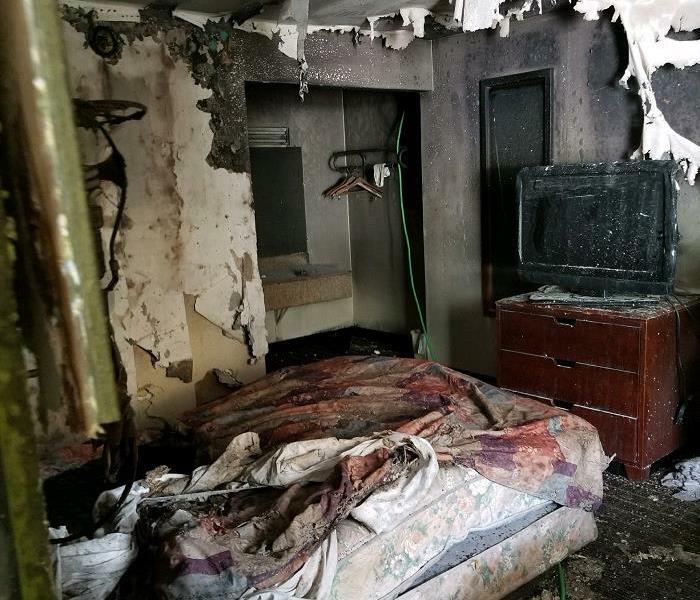 Fire damage can happen when you least expect it. SERVPRO of LaGrange Park/North Riverside is here to help. After the fire fighters leave your home or commercial property, give us a call at 708-240-4873 for all your fire restoration needs. 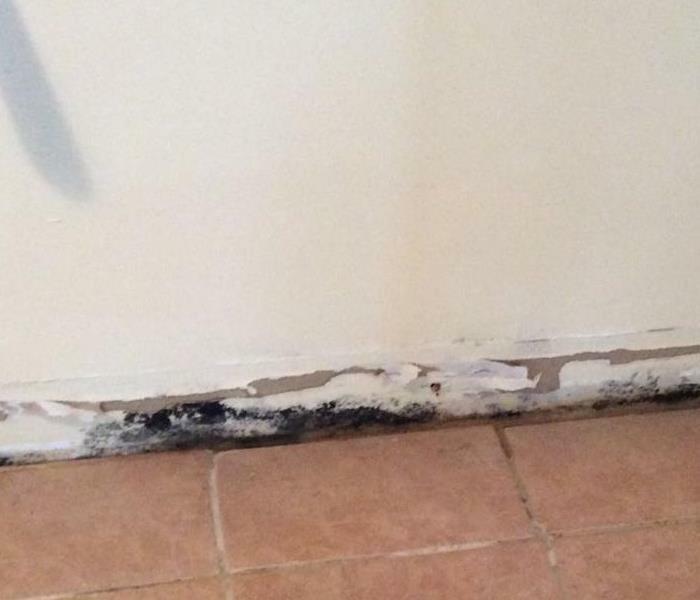 Mold seeks moisture, food, and warmth, and all three conditions are necessary for it to grow. Mold spores can reproduce in wet or damp parts of your home: areas that have had flooding or where leakage has occurred. If you suspect you have mold in your home, give SERVPRO of LaGrange Park/North Riverside a call. 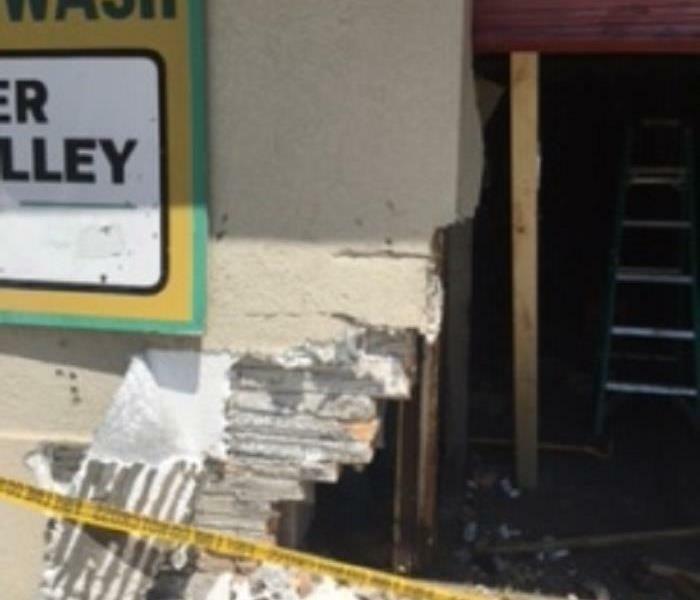 SERVPRO of LaGrange Park/North Riverside received a call in regards to a car that accelerated through the wall of a local car wash. Our crews are onsite and will have the board up completed, then then we will work with the owner for all their reconstruction needs. Local storms caused roof damage to this home. The roof damage caused water damage in return. There was water in three levels of this home that needed mitigated. If you have water damage, call SERVPRO of LaGrange Park/North Riverside at 708-240-4873. We are always here to help. Even just a little bit of water can cause your wood floors to start to buckle and warp. This floor had only had water on it for about 2 hours and you can already see the warping process starting. If you have water damage to your home or commercial building give SERVPRO of LaGrange Park/North Riverside a call at 708-240-4873. 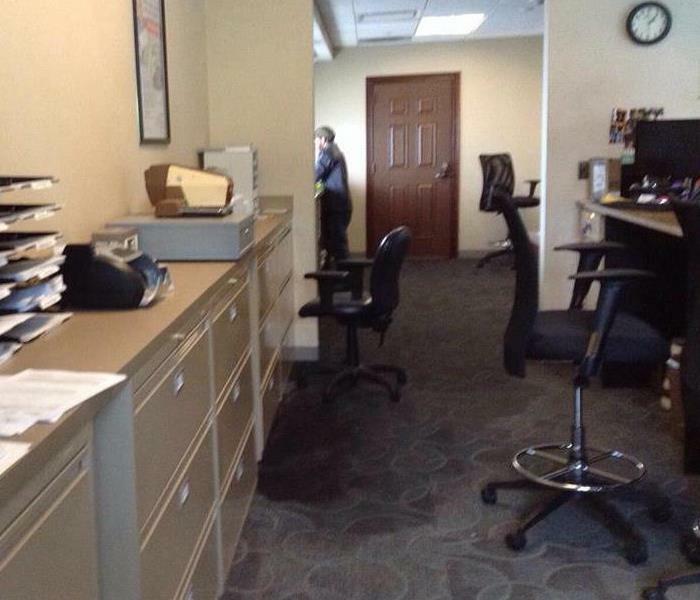 SERVPRO of LaGrange Park/North Riverside was called to help with a leak in a wall of an office. The water was contained to 1 wall, and some of the floor. Our crew was able to create a wind tunnel to get the studs dry, and get the office back to usable space in no time. 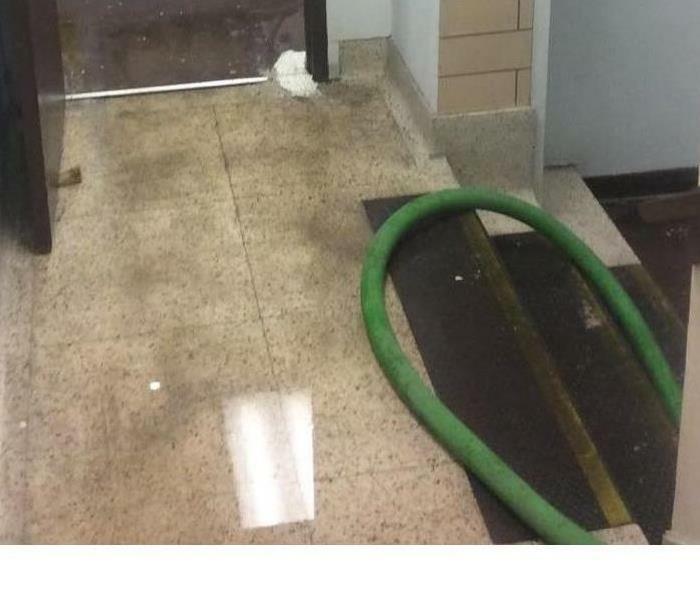 The sprinkler system malfunctioned causing the water damage to this commercial property. SERVPRO of LaGrange Park/North Riverside was called out to help with the clean up. If you have water damage at your home or commercial property, give us a call at 708-240-4873. "We are faster to any sized disaster." SERVPRO of LaGrange Park/North Riverside received a call to help with water damage to a ladies clothing boutique. 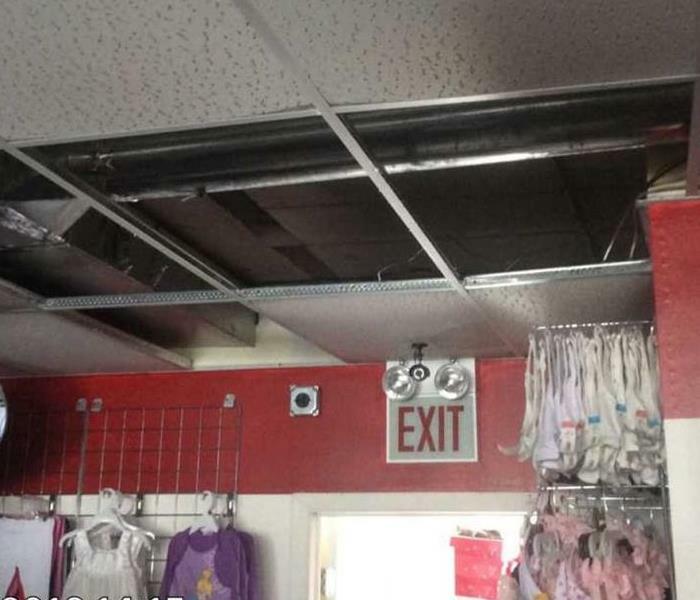 Due to an issue with the roof, water was dripping down to the boutique floor. SERVPRO of LaGrange Park/North Riverside received an emergency call due to a sewer back up in a condo. 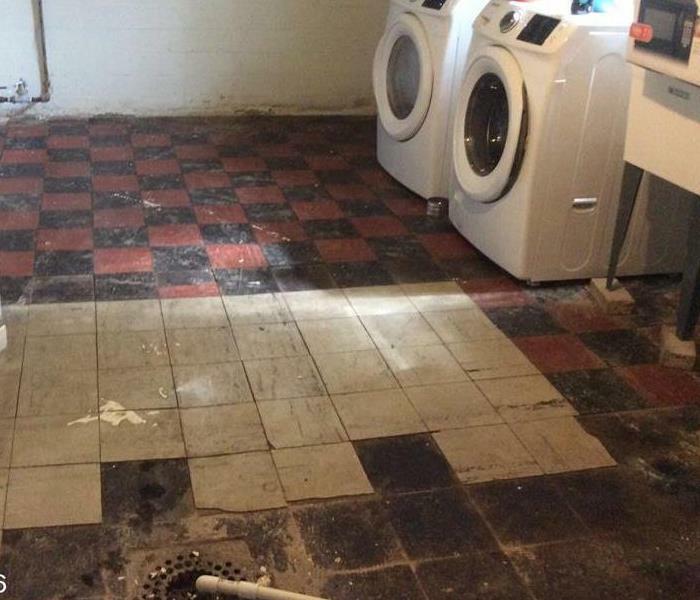 When we arrived onsite there was quite a bit of water in the laundry room area that needed cleaned, and deodorized. In Cincinnati, after a long string of rain storms the city experienced a city wide sewer back up. SERVPRO of LaGrange Park/North Riverside was asked to come help with the clean up of this area. This home had a floor drain that had backed up sewer water from the city drainage system. Our crew was sent out to clean up the flooring and the walls that had the sewage. The water had receded by the time we had arrived onsite, so it was up to our staff to clean up the cement floors and walls. After several days of rain and showers, Cincinnati OH had a city wide sewer drain back up, and was in need of help. SERVPRO of LaGrange Park was called upon to help with this clean up. This particular home had sewage water come up through the floor drain and had standing water in their basement. Hurricane Matthew hit many homes in the eastern part of the United States last year. Many houses and businesses were struck with some sort of water damage. This particular home had water damage through out the home. By the time we had arrived onsite, the water had soaked up the carpeting, pad, and into the walls. Its the unseen water that causes the most damage, especially when the water you don't see contains bacteria. SERVPRO of LaGrange Park/North Riverside was asked to assist in the clean up in VA after Hurricane Matthew. This office had several exam rooms, and their waiting area wet from the water from the hurricane. 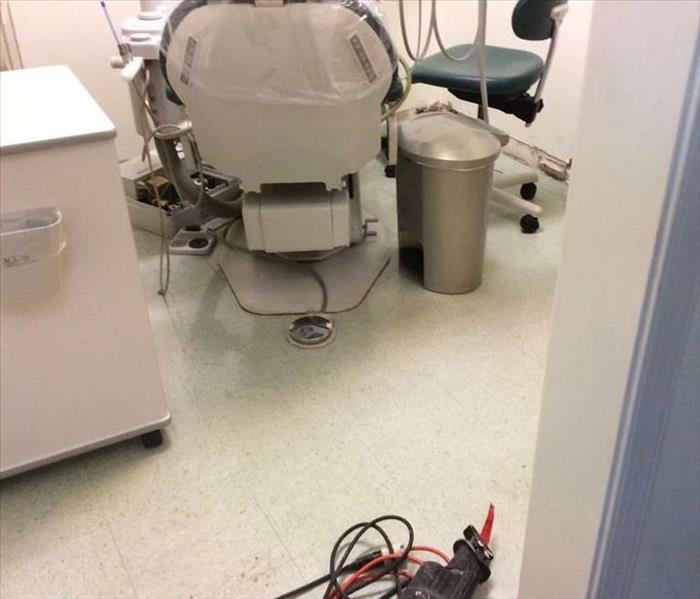 We were able to arrive on the job, and help restore the dentist office, and get them back to business. 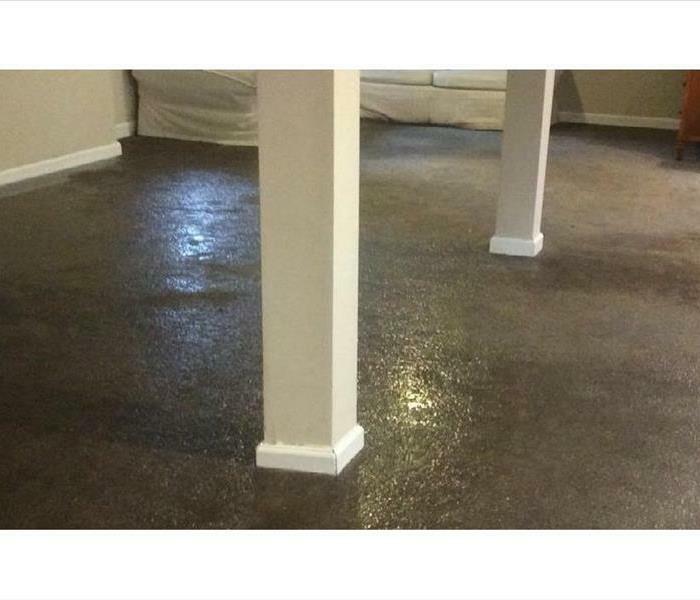 SERVPRO of LaGrange Park/North Riverside made it "Like it never even happened." This home had had water damage that had sat for an extended period of time. When we were called to come look for mold, we found a few spots on the wall. Those spots lead us to look under the baseboards where we found the microbial growth. 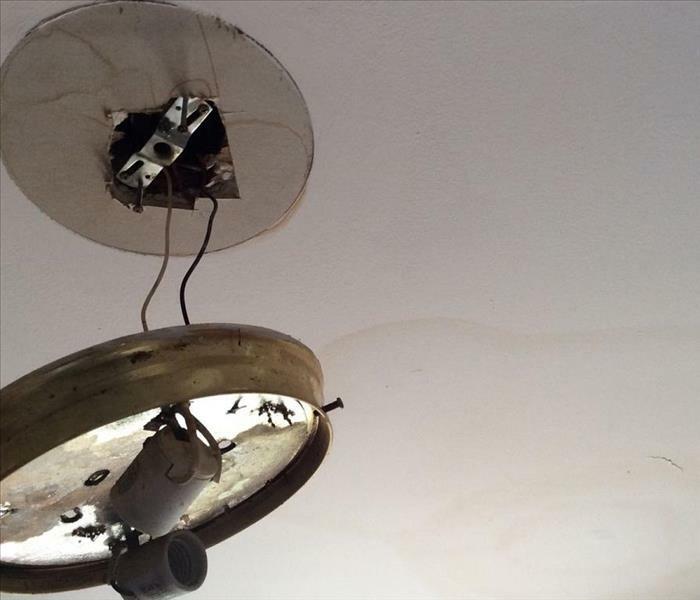 This homeowner called us when they saw the standing water in their light fixture in the family room. 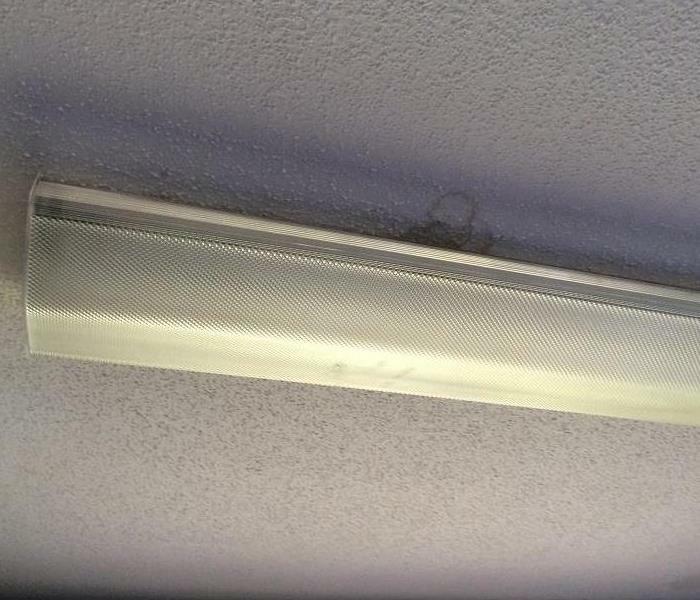 When we arrived onsite we noticed that there was water spots on the ceiling, as well as the light fixtures. The culprit, was a leaking roof. 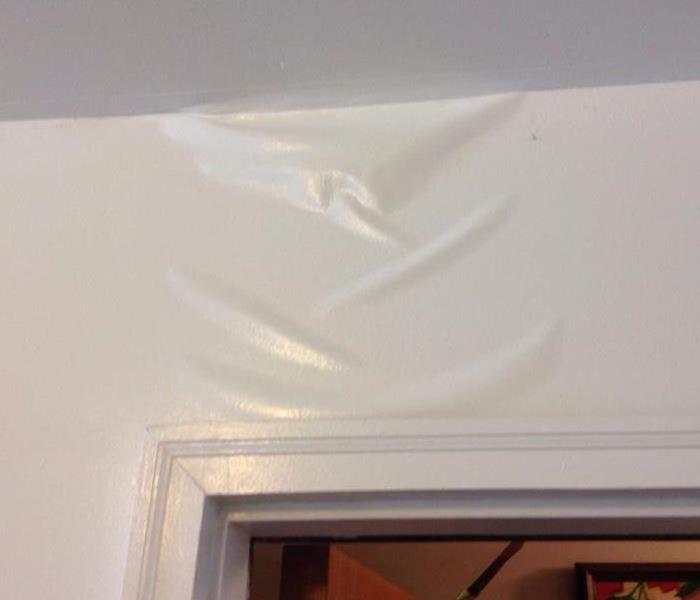 Due to some issues with a roof leaking, this home had trapped water in the ceiling. The ceiling had a pocket of water that has started to form a bubble. 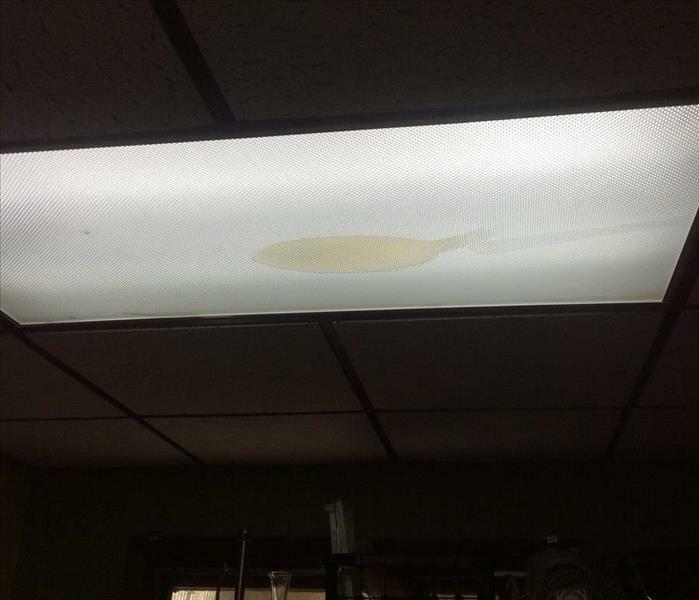 The water was also trapped in the light fixture causing it to sag. This is what was left of the wall studs after a house fell on the roof of this house. The tree took out an area of the home and crushed the wall studs. We were onsite to help this family get their home put back together. This commercial building had water damage to the roof and water had leaked into the ceiling above the office. Water had also got into the light fixtures. The SERVPRO team got on the job, and had this office back up and running the next business day. 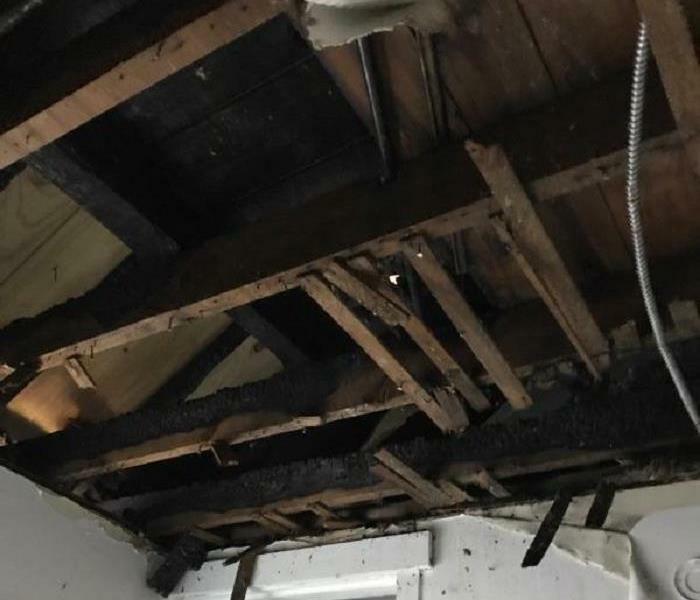 When SERVPRO of LaGrange Park/North Riverside was called to this fire we noticed that large part of the ceiling had to be removed by the fire department. Once we arrived onsite, we started the clean up, the smoke remediation, and making the home "Like it never even happened." This is what the aftermath was when a homeowner had an electrical fire in one of their outlets. They had overloaded an outlet when the fire started. 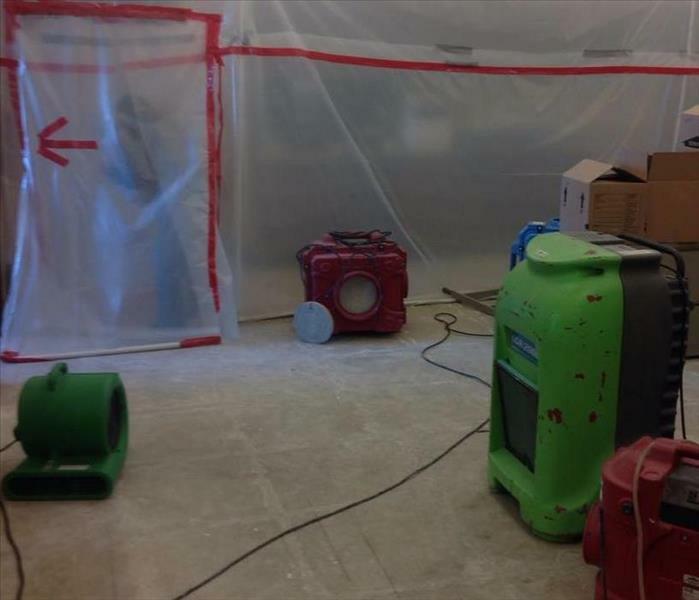 SERVPRO of LaGrange Park/North Riverside arrived onsite and began the smoke remediation. The homeowners were happy to get their home back to normal in such a short time. When we arrived to this home, we found that the water had entered through the roof, and had collapsed the roof in several areas of the home. Being "Faster to any size disaster", we helped this homeowner clean up the area. We also put a tarp on the roof, and did all we could to keep any further damage to happening to the home. This home had sewage water that backed up from the city into their basement. It had affected most of the flooring, however it did not get high enough to affect drywall. We were able to get the carpet out, get the floor cleaned, and get the homeowners their home back right away. In September of 2016, the city of Cincinnati had a city wide sewer storm drain back up affecting many homes in the sounding area. Storm team activated surrounding SERVPRO franchises to assist in the clean up. SERVPRO of LaGrange Park/North Riverside was honored to deploy to OH to help the storm team. This particular home had sewage back up in spots up to 5 feet, and an entire office and play room that had contents affected. When we were called out to this job we were told there was water in the stair way. Little did we know it was 4 flights of stairs that all had water damage. We quickly got the clean up started and set equipment to dry. Getting the business up and running again in as short of time as possible is always our main goal. 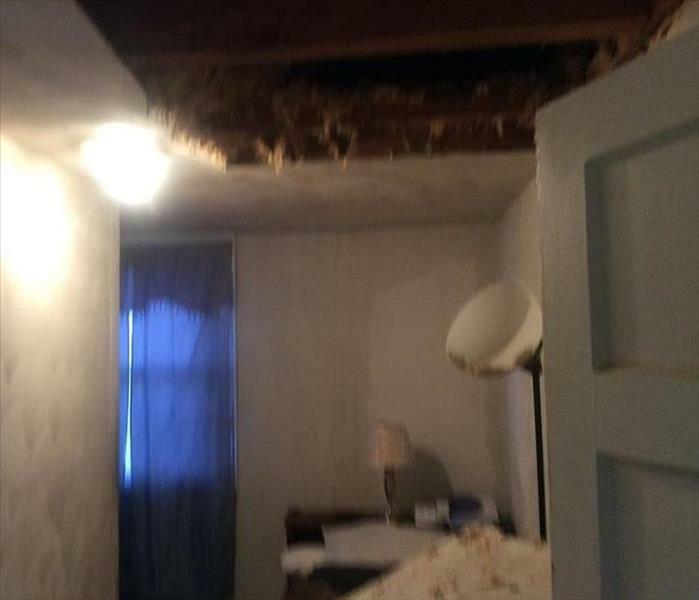 We received a call that this office had a collapsed ceiling from water leaking in the unit above them. When the crew arrived onsite, this was the aftermath of the water damage. We quickly got to work drying out the area, and cleaning up the collapsed ceiling tiles. A local manufacturing company called with a serious emergency. They had water flooding their warehouse and needed help right away. When we arrived onsite we sprung into action and began immediate water extraction, and setting up drying equipment in order to get that business back up and running. A water pipe broke in this restaurants ceiling and water damage had affected most of the bar area. Our crew arrived onsite and immediately started extracting the water, took out the wet ceiling, and set up equipment to begin the drying process. This customer called us to let us know they had a pipe break and water was flooding into their storage area. When we arrived onsite we immediately started extracting water, spraying antimicrobial agent, and drying out the area. They were grateful that we were able to arrive onsite and get their items saved from the water. One of our local businesses called stating that they were seeing spots of mold in various areas of their office. Our crew arrived onsite to find several areas that had some microbial growth. We went to work to clean up the areas and get them back to business as usual. 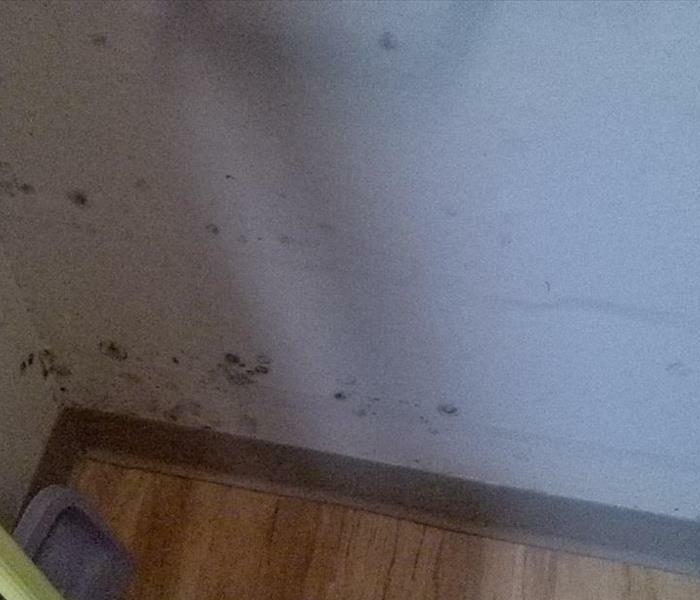 We received a call from a customer stating that she noticed some mold growing in a corner of her bathroom. When we arrived onsite, we went to work cleaning up the area. 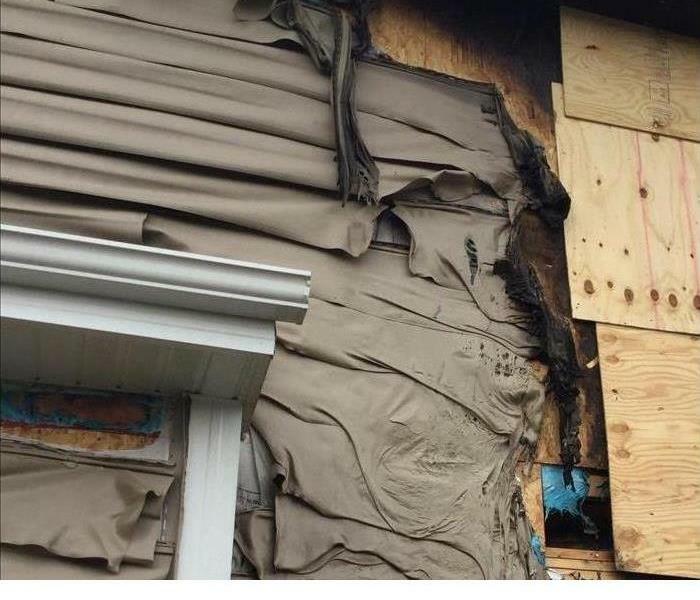 The homeowner was very happy with how quickly the crew made it "Like it never even happened." This was the aftermath when the families pools water pump caught on fire and caught the back porch area on fire along with it. We arrived onsite to assist in removing the rest of the debris. We also boarded up the home, and began fire mitigation on the inside. This is the aftermath of a home fire when we arrived on the scene. We are currently in the process of cleaning up the area for the homeowners and making it "Like it never even happened." We received a call about a large barn fire. This was not your average barn as the homeowner also has an office area in the loft. The entire barn was full of smoke and soot that we needed to clean. 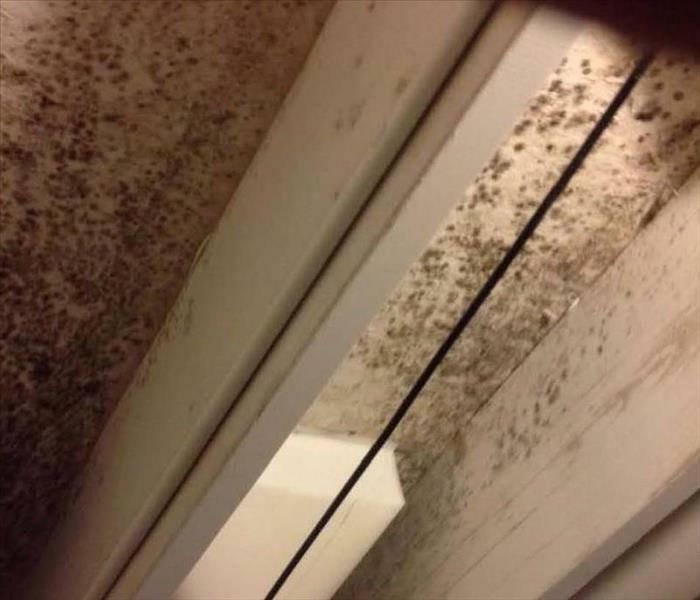 We received a call from a home owner stating that she had mold on the ceiling of her basement laundry room area. We arrived onsite, did our remediation the mold. 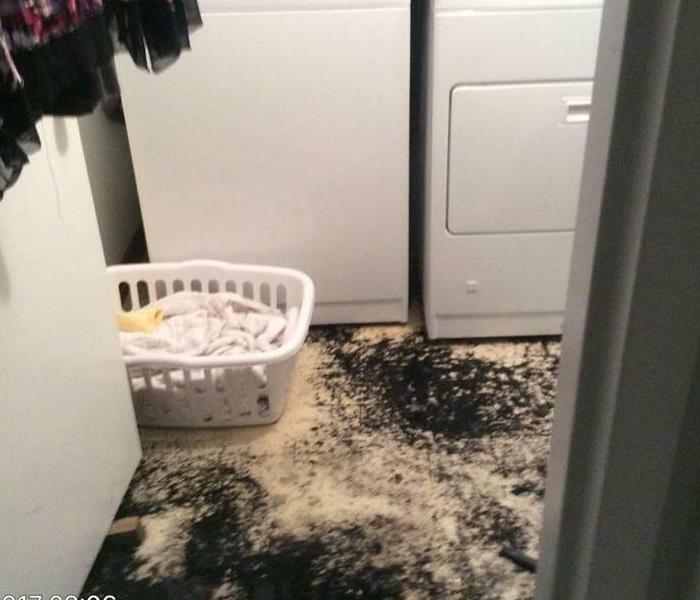 The customer felt much better knowing that we had made her laundry room area look "Like it never even happened." 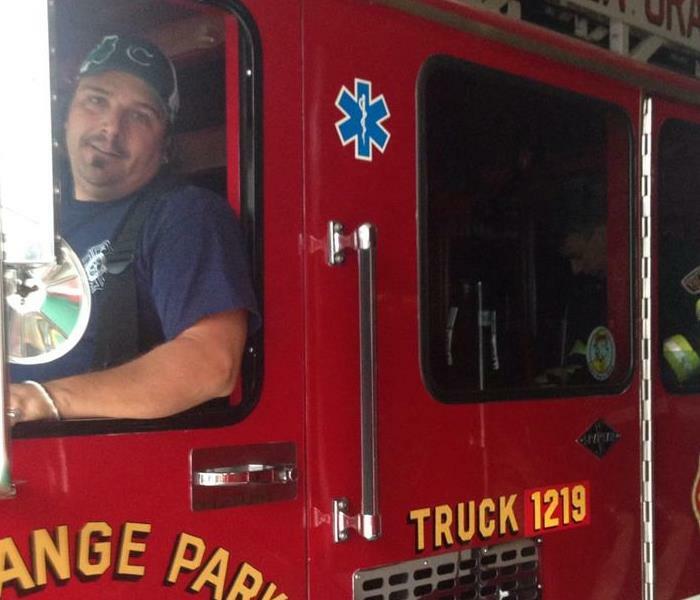 While discussing with the police chief in Broadview about doing some clean up work in the cells and around the police station, SERVPRO of LaGrange Park/North Riverside was introduced to the fire chief in Broadview as well. The fire chief and SERVPRO are working together on ERP's with local businesses. While visiting the fire house in LaGrange Park to deliver a turkey to celebrate Thanksgiving, we got to check out the fire trucks. The firemen loved showing us around and explaining what all the engine holds in the event of any size fire they encounter. Turkey delivery to the Westchester fire department, and thanking them for all they do for our community. 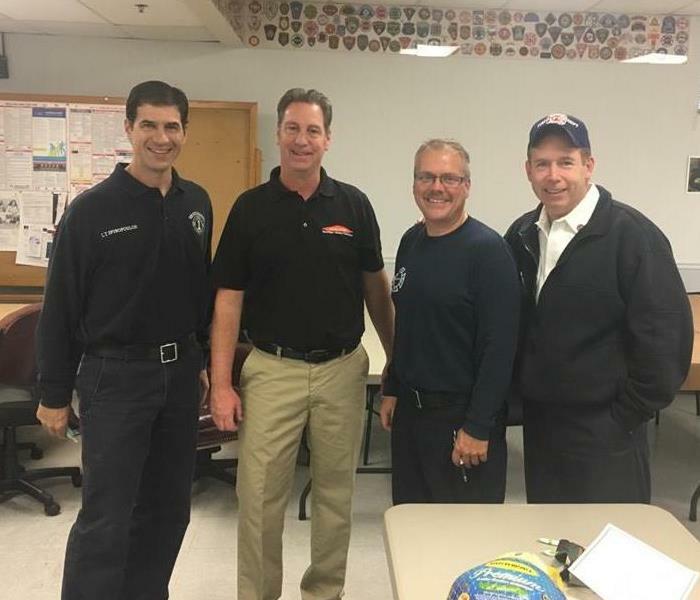 The Westchester fire department and SERVPRO of LaGrange Park/North Riverside have teamed up in the community to provide outstanding service to those in need. Our owner, Jim, visited the local community center in North Riverside and donated 2 turkeys to help feed the 100+ families they will serve this Thanksgiving. The community center does so much for the North Riverside area that it was our pleasure to give back to the community. 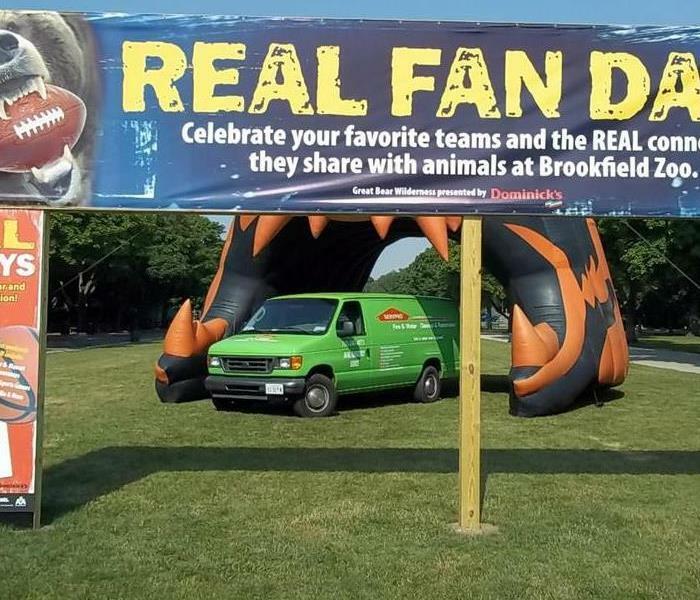 Working together with the Chicago Bears and Brookfield Zoo, SERVPRO of LaGrange Park/North Riverside had an opportunity to show off our vans, equipment, and have an informational booth to connect with the community. SERVPRO of LaGrange Park/North Riverside is a proud sponsor of the Brookfield Zoo.